The New York Post is reporting that the infamous masked Catwoman has been captured! The feline wannabe is being charged with robberies in Manhattan and Queens after holding up several establishments disguised as a cat burglar. "The suspect was identified as Shanna Spalding, 28, of Queens, who sings with a death-metal band called Divine Infamy under her stage name, Purgatory. The burqa-clad suspect was picked up in SoHo after bursting into a Greene Street boutique with a gun and demanding cash, sources said. 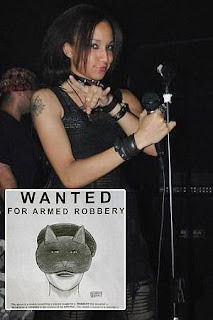 She allegedly threatened to shoot up the place if she didn't get her paws on the dough." Spalding made headlines back in June when police posted a comical wanted poster of her donning a cat mask.